So you’ve got a perfectly decorated condo in Center City. You’ve selected the sleekest furnishings, your walls are dotted with art and photographs, and you’ve even added some decorative objects to your tabletops and shelves, but somehow your place doesn’t seem done. It’s beautiful, yes, but a bit cold and impersonal. How do you bring your rooms together to make your space feel like home? Easy. Just add a collection of lush plants from Plantscapes USA. 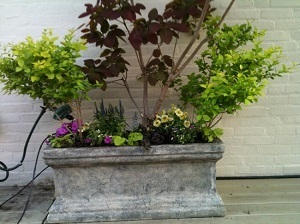 We are the best interior landscaping company to find interior design plants in Philadelphia. Ok…ok…we know. You’re not good with plants. You’ve tried. You’ve got bad memories of drooping dracaena and floundering ficus. Even the so-called simple to care for plants turned out to be not so simple. Remember those cactuses? Sigh. But don’t give up! You can fill your home with the most beautiful plants around. We can help, and the best thing is…we offer installation and maintenance services for your plants so you don’t have to. Plantscapes USA will survey your place, taking note of the light source and air quality to select just the right plants for each room. This consult service is free and totally thorough. Once we’ve determined just how to brighten your space with plants, we can get started on installation. We have an incredible selection of international ceramics for plant potting that you can choose from that will complement every type of decorating style and color scheme. After your plants have been installed, Plantscapes USA will revisit weekly for plant maintenance, so you don’t have to wonder and worry about over or under watering. Our trained plant technicians will take care of everything. They will water and fertilize your plants, clean and polish any foliage that has gotten dusty, and monitor to see that the leaves and fronds look bright. What about repotting? Don’t worry. Plantscapes USA will do it, and even if plants aren’t ready for that yet, our technicians will make sure the soil is in the best condition, they will replenish it with fresh moss and bark when needed, and they will make sure the plant containers are in great condition, too. What we’re trying to say is that we at Plantscapes USA will do everything we can to make sure that you have a home filled with the beauty of plants. With us, your rooms will have that sophisticated, yet cozy feel that you’re after, and your collection of plants will freshen the air and brighten your space. So stop thinking about those failed plants and start thinking about Plantscapes USA. We can create a beautiful and well-maintained array of plants (even dracaena and ficus) that will thrive in your home. So, how do you get Plantscapes USA to fill your space with beautiful plants? Contact us today at 610-329-3935 for your free horticulture consultation or visit us at PlantscapesUSA.com. We are the finest resource for interior design plants in Philadelphia and we just can’t wait to fill your place with plants and help you decorate your space with style. 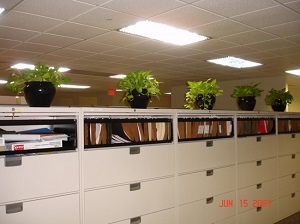 Get the Perfect Plants for Offices in Philadelphia from Plantscapes U.S.A. The office can be a place of high stress and anxiety for anyone. Whether you have an open office or are stuck in a cinderblock fishbowl with fluorescent lighting, anyone should be able to make their workspace greener and more inviting than it currently is. Plantscapes U.S.A. creates a beautiful and lush green setting for your workspace. We want your office space to look like you are spending the afternoon in Rittenhouse Square, if that’s what you want. 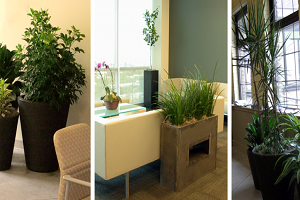 Our unique and diverse array of plants is the perfect plants for offices in Philadelphia. 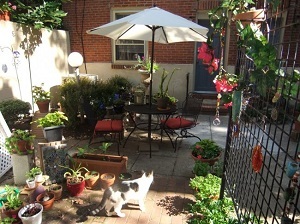 Philadelphia is a city that values nature, so we know how important it is to keep your workspaces fresh and green. Plants have been known to help workplace productivity, and many businesses agree that it is important to start adding them to the workplace to make the workspace more pleasant. A study done by NASA showed that plants help to cleanse the air of harmful pollutants such as paints, plastics, insulation, plywood, carpets, synthetic fabrics, and detergents. Your office building is tightly sealed which makes it a perfect place to have some fresh air plants to cleanse the air. These plants are perfect for helping to regulate the humidity, which can lead to illnesses like the flu or a cold when the air is too dry. Our plants are able to add a little bit of humidity to a dry or overheated office space. Washing State University conducted a study, which showed that when plants were in an office building, the humidity was stabilized at 30-60%, making it a pleasant environment to work in. Realizing how important it is to make sure plants are brought into your office? We will gladly help you get started on bringing plants for offices in Philadelphia. 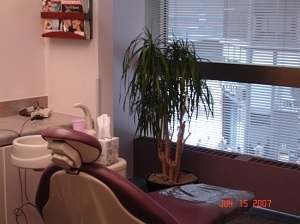 We make sure to plan, install, and maintain your plants in your office space. We want to make sure that you are satisfied with whatever plants you chose as your office pieces. Our experience will ensure that we will create a clean and lush environment for any type of space. Some of the places we have installed plants in are reception areas, meeting rooms, lobbies, individual offices, and hallways. 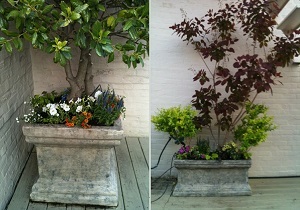 We can bring a green garden to any office space, no matter if it is big or small. We have decorated any type of businesses that range from car dealers to dentist offices to gym and workout facilities. Bring some green to any space and create a welcoming space no matter what. Don’t have a green thumb? That’s okay. The best part is that you won’t have to worry about the upkeep of your plants; we’ll do that for you. Our plant maintenance in Philadelphia includes weekly visits by our trained professionals and special care for each unique plant you chose. We will also fertilize your plants as required so that it will continue to grow at a healthy pace. Our techs make sure that your place is fully pruned or extra foliage is removed and will be re-potted in Spanish Moss or bark if needed. We care about making sure that your plants live long and healthy lives, so make an appointment to see how we can enhance your office space to a green garden today. Excellent Plant Maintenance in Philadelphia from Plantscapes U.S.A.
Get the high-quality plant maintenance Philadelphia offers with Plantscapes U.S.A. We’re a locally owned business founded by two individuals with a passion for all things plants. Whether it’s plant installation or maintenance, we’ll be more than happy to provide you with timely and effective care for all of your plant-based housing needs. Our maintenance services include technicians that are trained to handle plants with the utmost care. They’ll make sure that your plants are properly taken care of. On a weekly basis, they’ll make their visits to ensure all plant life is receiving the right amount of nutrition and natural light. If there is any sort of unneeded additions such as foliage or weeds, they will be pruned and disposed of immediately. If you’re looking for a replacement in your pottery, our maintenance program provides re-potting along with a fresh batch of soil to stimulate the plant’s roots. For stuffing purposes, we’ll also include Spanish Moss or bark to give the plants both stability and nutrition for its structure. You’ll be able to enjoy your flowers even more after we’ve given them the proper inspection and care it deserves. Whether these are plants for your company’s office, or something small and simple for your residential home, Plantscapes U.S.A is here to give you the best plant maintenance Philadelphia can provide. Getting the right type of maintenance for your plants are important because they aren’t just for aesthetic, they’re actually known to improve the overall quality of the environment they are placed in. Much like natural lighting, plants can affect the overall mental health of those that spend large amounts of time in a singular indoor area. They improve the air quality of the room with the chemicals that they release into the air. These will counter the pollutants that are released by indoor necessities such as HVAC units or carpets. The better these plants are cared for, the more often these chemicals can be released, which will, in turn, benefit you and your co-workers (or employees) for the better. So why should you ask for regular plant maintenance for your office or home space? You’ll just be that much happier afterwards. Humidity is a constant uncomfortable distraction, especially in hotter seasons such as summer, where it can be felt on an almost daily basis. A plant that is well taken care of will absorb all of that extra moisture in the air and keep humidity to a more stable 30-60%. On the other hand, if the air is too dry, plants can also add moisture to the air and keep that humidity under control. By keeping the humidity of certain spaces in check, those living in or constantly working in a space where the plants reside are less susceptible to humidity-based ailments such as the flu. At Plantscapes U.S.A, we’re not only using our plant maintenance services to take care of plants, but we’re also taking care of you and your peers. If you’d like to see examples of our work, you can always go on to our website and look at the ‘Projects by Us’ category page. You’ll view our portfolio where we’ve applied our services in a number of different environments such as corporate events, family homes, and different outdoor areas that are meant for different seasons. For any questions that you may have in regards to our services, do not hesitate to give us a call. We’ll be more than happy to answer them in a timely manner to get your plants in shape. Contact us today! There’s something to be said about the luxury of lining your home or office with fresh and gorgeous houseplants. Having plants around us eases our minds and makes the air a little nicer to breath (literally); there’s really no downside to decorating with nature. When you do, you’ll see a better style emerge from your home, and a better style leads to better days. After all, our surroundings heavily impact our mood, so why not surround yourself with serenity? Plants have been making a name for themselves as a solid option for interior designers everywhere, and that’s since the dawn of man. When you’re looking for interior design plants Philadelphia based, you’re looking for Plantscapes USA. With deep knowledge and insight into different plants and how they thrive, Plantscapes USA is here to help make sure your plant needs are taken care of. When you think of interior design plants Philadelphia isn’t exactly what pops into mind first, but why not? Some of the best interior designers come from these metropolitan hubs, and the University of the Arts lines Broad Street with some of the best interior decorators of the next generation! These designers know one thing will always remain constant when decorating your home: it has to feel like home. You can’t truly enjoy your living space unless you feel alive within it, and plants are the perfect way to boost your morale and improve your mood. It’s a well-known fact that being around nature is a healthy practice, but some of us can’t spend the time to go on a hike every now and then. For those that can’t, Plantscapes USA is here to revitalize your living space and bring nature to you! With so many gorgeous plants to choose from, it can be a hassle figuring out which is the right choice for your home. Luckily, Plantscapes has the expertise that you need to deck out your lawn, office, or anywhere else with the plants that make it come to life! We want your life to improve, and that goes for anyone that enters your workspace or home! Interior decorating is complicated; fads come and go, but plants will always remain popular. That’s because plants make us feel connected with the outside world without having to leave the comfort of Summer’s much-needed air conditioning! No matter who you are, you can benefit from redecorating with the natural world in mind. There’s nothing better than a little green to make your day a little brighter! So, what kind of plants are you looking for? Is it for your office? Your home? No matter where you’re trying to decorate, Plantscapes can help. We’ve got the professionals that understand how to artistically place plants within your space to boost morale and visually please anyone who enters! If you’re a little unsure of what you want, but know that you want something, feel free to contact us! We’re eager to help steer our customers in the direction that suits them best, and we’ll do anything we can to make sure that your experience is superb! Sometimes, despite our best efforts, going to work can become mundane and dull. Even if we love what we do, the routine of work can sometimes weigh heavy on us and make us feel unhappy. By creating a beautiful and serene work environment, we can boost the mood of our co-workers, employees, and bosses so that everyone can feel more productive and happier in the workplace. A great way to liven up your office space is by including indoor plants. Indoor plants are an attractive and vibrant addition to many offices and can boost morale by incorporating a natural element into an otherwise unnatural office atmosphere. So when you are looking for the best indoor office plants Philadelphia can offer you, you need to consider a number of things when you make your selection. The best indoor office plants Philadelphia can provide depend on a number of things. First you need to make sure that the arrangement you choose is within your budget. While a sprawling garden of exotic plants and flowers would be incredible, it may not be realistic for your workplace. Be sure to choose plants and arrangements that make sense with what you have to work with. Another consideration is the care of the plants. If your indoor office plants need to survive in low natural light or at temperatures in the 60s and 70s, do not purchase desert plants or tropical plants that very specific environmental requirements that you may not be able to provide them in an office setting. You want to pick hardy plants that are both beautiful and easy to care for so that whoever is in charge of their care can spend minimal time with them and more time working. If you want a unique interior plantscaping design, hiring a plantscaping company may be the best option for you. Creating a beautiful display of attractive, vibrant plants can be done by professionals who can choose plants that are the right look and fit for your office environment. Maintenance, too, can be arranged so that all the stress of their care is removed and you can focus on what is most important to you. A member of the plantscaping staff can visit your workplace regularly and keep your plants in optimal health and vibrancy. You can enjoy your beautiful indoor natural scene while incurring none of the stress of plant care. When it comes to choosing a great arrangement of indoor office plants, a final consideration might be space. It is important to determine what kind of room you have available for these plants so that your selection can be catered to that. 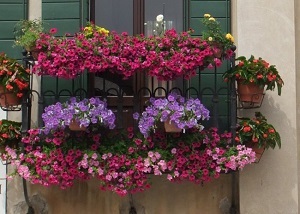 Be sure, too, to choose plants that will not grow excessively and become a nuisance that will make your plant arrangement start to look unmanaged and not well cared for. Indoor office plants typically require less maintenance than outdoor ones but in order to keep an office clean and vibrant, maintenance cannot be ignored. 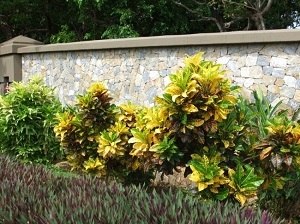 At Plantscapes USA, we install and maintain beautiful plantscapes for your office, home, and garden. Visit us online and get started, today! Adding plants to a regular setting can add a positive ambiance and beauty to any room, whether it is in your office, living room, or simply spread throughout your home. At Plantscapes USA, we take great care of your plants during our plant installation and aftercare process to make sure your plants stay lush and beautiful. Living in the city can be hard and grey, with almost no signs of greenery, depending on where you live. That is why Plantscapes USA is here to provide you with indoor plants for homes in Philadelphia. Including plants in your home is a great way to add some healthy green to your living space. Whether you live in a modern townhome in Fishtown, an exposed brick studio in Old City or even an apartment with friends in University City, Plantscapes USA wants to make sure your home is lush and eco-friendly. 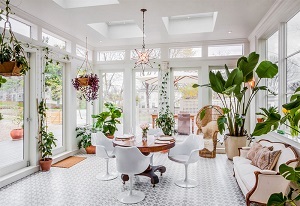 Incorporating indoor plants for home in Philadelphia can come with many benefits. Some of the plants we provide have the ability to cleanse the air of harmful pollutants from everyday home items such as paint, plastic, insulation, plywood, carpets, synthetic fabrics, and detergent. Different species of plants are better suited for different environments, so it’s important that you pick one that is best suited for your home. Plants can add endless decor to any room in your house, from adding a sophisticated flair to setting a cozy area. Some of the best locations for indoor houseplants are in a sunroom, living room, entryway, home offices, nooks & crannies, and even atriums. We want to make sure that your live plant experience is unique, just like the space you are decorating. We provide live plants, planting supplies, and plant accessories to help provide a healthy and welcoming space for your plants. We create any type of environment you are looking for from a warm, cozy, and colorful setting to peaceful, green and beautiful. We also offer complete care and maintenance of the plants so that they last longer and provide you with the utmost beauty and relaxation. 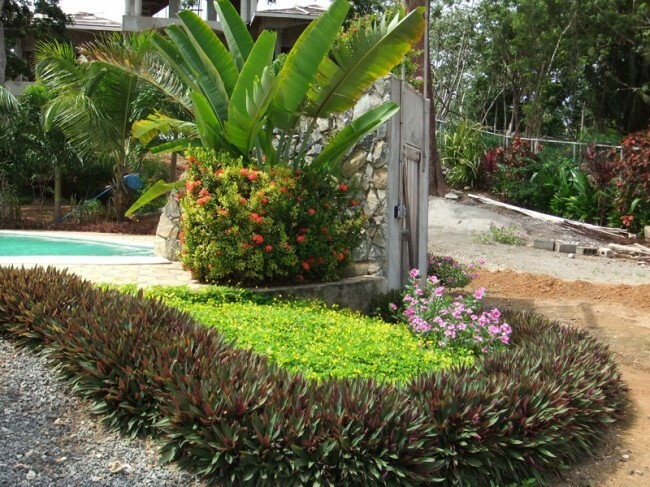 At Plantscapes USA, we take great pride in providing you with maintenance for your chosen plants. We send a fully equipped and well-trained technician on weekly visits to make sure your plants are receiving adequate water as well as making sure the amount of fertilizer needed is correct. We also cleanse and shine foliage as needed, as well as re-pot any plants with fresh Spanish Moss or bark if and when required and provide regular inspections for pests and plant diseases with treatment so that your plant can have a long life. In addition to these services, we also have a great selection of international ceramic pots that will match any decor. Our main goal is to bring your space to life with thriving, lush plants by creating any type of atmosphere you want. Call Plantscapes USA to receive your free horticulture consultation and start your indoor creation, today. We love plants and we love providing services to homes that need them. Check out some of the best indoor plants for home Philadelphia has to offer with Plantscapes U.S.A. Our local business has some of the best plants that can add a fresh new look to your living space. Whether you live in an apartment or a house down the street, our plants are sure to give your home a pleasant touch. Head on over to our website and check out the selection of plants and plant-based services we have available. You’re probably wondering what our true mission is? It’s to use plants as a means of making living spaces cleaner and more comfortable for folks such as yourself! Did you know that plants can clean the air? Studies by companies such as NASA (yes, the NASA), have proven that having live plants in an indoor facility can cleanse the air of different pollutants that you normally wouldn’t recognize. You would be shocked to see how far things such as that go. By having cleaner air to breath in indoor environments, you’ll find yourself even more productive and working at a more efficient pace thanks to the cleaner air that the plants have helped provide. They also give off a sense of a more natural environment. When you hire us for plant installation service, we’ve always got your well being in mind. Isn’t it incredible how much indoor plants can do for you? If you need any more convincing of our services, you’re more than welcome to look at our portfolio on our website. Our “Projects By Us” section includes a variety of pictures of plants we’ve successfully installed for clients over the years. Look at the design and attention to detail that we look very carefully into. Having that nice touch added to your home or work space can make a huge difference in a variety of ways. We at Plantscapes U.S.A completely cherish that touch and do everything we can to ensure that your house looks and feels as great as possible when we add our plant work to your environment of choice. Apartments? Condos? Office? None of these are too much for our services and we’ll be more than happy to provide you with some of the best indoor plants for home Philadelphia has available. Want to further your education on plants and plant-based accessories? Our video page is super helpful in providing you with helpful and engaging content that gives you detailed insight on how to take care of plants. One of the most difficult parts of nurturing a plant is growing it while it resides under the shade. We’ve collaborated with Home and Garden TV Show host, Jamie Durie, to give you insight on how to successfully grow a lush garden under the shade. Videos such as these will keep you intrigued and wanting to learn even more about why a company such as ours has a passion for working with plants! If you’re interested in our services, contact us via our “Contact” page and we’ll reply as soon as possible. Whether you’re looking for full on work or just a free consultation, we’ll be there for you! Plants and flowers have played an important role in bringing vividness to the world. There have been stories, poems, and songs written to depict each petal, leaf, stem, and spore of plant life. Paintings, sculptures, and photographs depicting the fine details of various plants hang in the world’s most prestigious galleries and museums. This isn’t without reason, of course. Plants are known as symbols of life, beauty, and growth. By keeping plants in your home or office, you can convey an air of health and growth indoors. Indoor plants can add a comfort to your décor that can’t be paralleled. If you’re looking to bring life to your Philly based home or office, Plantscapes USA is here to help. If you’re looking for indoor office plants in Philadelphia, there is no need to look any further. Choosing interior plants for a business can be tricky. It’s very easy to make the mistake of purchasing an indoor plant that looks great at first, but requires a bit more upkeep than you might expect. This can leave plants looking uncared for. The last thing you want is to buy a plant, only to have it sulk and wilt. When you’re running a business, you’re already busy enough. Plant maintenance shouldn’t have to be another huge concern. While any living thing needs some TLC, that shouldn’t be a forefront concern. With Plantscapes USA, keeping plants doesn’t have to be so much work. Plantscapes USA offers plant maintenance to ensure that your plants are as healthy and as beautiful as they were when you purchased them. They will send out skilled technicians on a weekly basis to ensure that your plants are receiving the proper amount of water. In addition, they will re-pot your plants whenever necessary. They will prune your plants and check to make sure that pests aren’t hindering the growth and health of your arrangement. They’ll even facilitate plant fertilization to keep them growing at a healthy pace. There’s a lot of care and maintenance that comes with owning plant life. Rather than selling you an arrangement and hoping you’ll be able to handle this much upkeep, Plantscapes USA will provide that service for you. They’ll make sure your plants look healthy and lively. After all, they know that health and natural livelihood is a huge part of the reason why people like to keep plants. 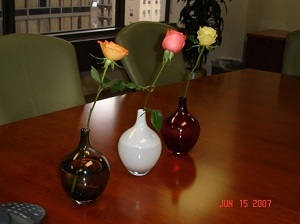 Any business space can be brought to life with well-cared-for plant arrangements. When your plants are properly tended to, they project the feeling of care and attentiveness—two qualities that any business needs in order to flourish. With Plantscapes USA, you can rest assured that your arrangements will be nourished by experts, with practiced hands and knowledge about plant care. If you want to create a welcoming atmosphere, you’ll want to include healthy plants. Turn to Plantscapes USA for the best indoor office plants in Philadelphia. Your business will spring to life with their impressive selection of plant arrangements. To learn more about their interior plantscaping services, visit their website today!